Last post 03-12-2012, 8:05 AM by Kenneth. 7 replies. I have cute editor running in two separate domains. Recently, I realised that one domain when trying to upload an image file, it gives an FLM error while the other domain works fine. I have tried using different browsers but it is still the same, one works and the other does not. They are both in the same web server. The cute editor copied into the server are exactly the same too. What causes an FLM error ? Hope someone can give some light to this problem. Please change the upload type to IFrame, then it will shows you the actual error message. I think your site has not the write/read permission of the default temp folder of php. Please change the php temp folder permission and ensure that your site and write/read of it. 3. If the way above does not fix the problem, then please change the default php temp folder permission. I've contacted the hosting provider and they have created a local php.ini file for me. 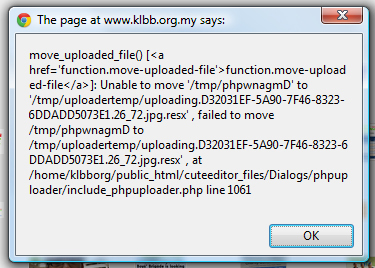 I tried changing some configuration thru the php.ini file but I still get an error trying to upload files. Please have a look at a chart I have created comparing a domain that works (left) and the problematic one on the right. I believe it is something to do with the TEMP or PERMISSIONS. I hope you are able to guide me on what to do next. perhaps you can guide me on what should be configured locally in order for cutesoft editor to work perfectly. Please check the upload_tmp_dir setting of your php.ini. Ensure that your site has the write/read permission of this folder. Also, you can set it to a folder which under the root of your site. I have already got the webhosting provider involved, they have checked & tested and they are not able to resolve the problem. They have already done whatevery necessary settings and yet we still cannot upload. The same error occurs. I have even tried using different domains in the same server, same error occured. I also tried using another server and the same problem occurs. I like to give you access to the hosting and hence you can test and experiment and hopefully you can find the problem. Pls provide me an email address that I can send to. I have a few projects using CuteEditor and it seems like all of them gives problem when trying to upload a file. I hope to hear from you very soon.